Camera: Canon EOS 450D; Lens: Canon EF 70-300mm f/4-5.6 IS USM; Focal Length: 300mm; Aperture: f/5.6; Shutter Speed: 1/250; ISO: 400. 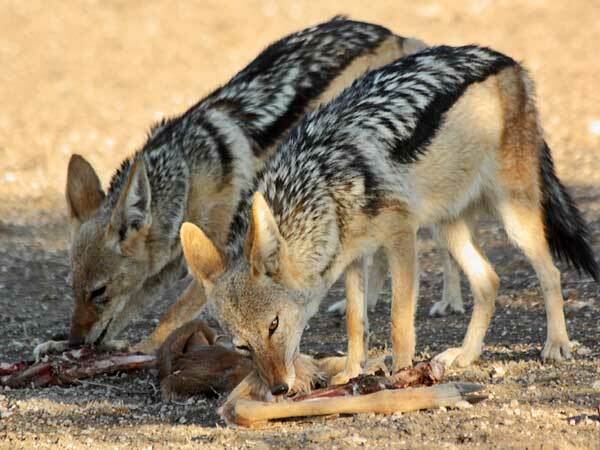 Location: This picture of a pair of jackals feeding on antelope remains was taken at 5.14pm in Mashatu Game Reserve in the Tuli Block region of Botswana. A cheetah and her sub-adult cub had earlier taken down an impala and, after eating their fill, had left the remains for the jackals and other scavengers. Mashatu, a Rattray Reserve, is not as famous as the Rattray family's flagship, Mala Mala, but is much more affordable and somehow feels more wild. You won't see the Big Five in Mashatu as there are no buffalo or rhino, but there are large herds of elephant plus predators like lion, leopard, wild dog, and cheetah that prey on herds of impala, wildebeest, and eland. Zebra and giraffe are also common in the reserve.